I was invited to talk to the firemen at the Heston and Isleworth Fire Station, on the outskirts of London. 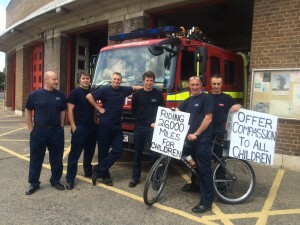 Some of these men have young children so they have been very interested as the Kindness Bicycle has passed by their station on a number of occasions. This entry was posted on Tuesday, July 8th, 2014 at 7:36 pm	and is filed under Kindness. You can follow any responses to this entry through the RSS 2.0 feed. You can leave a response, or trackback from your own site.